We are thrilled to announce three upcoming events in “Reflections From The Field”, a new speaker series at Swarthmore College, which brings people working on the front lines of conflict and social change to campus to reflect upon *what* they do, *why* they do it and how *they* came to do it. 1. “These Birds Walk”, a film screening and conversation with director and cinematographer Omar Mullick. In Karachi, Pakistan, a runaway boy’s life hangs on one critical question: where is home? The streets, an orphanage, or with the family he fled in the first place? Simultaneously heart- wrenching and life-affirming, THESE BIRDS WALK documents the struggles of these wayward street children and the humanitarians looking out for them in an ethereal and inspirational story of resilience. Listed by The New Yorker as one of the best foreign films of the 21st century, this is a must see! 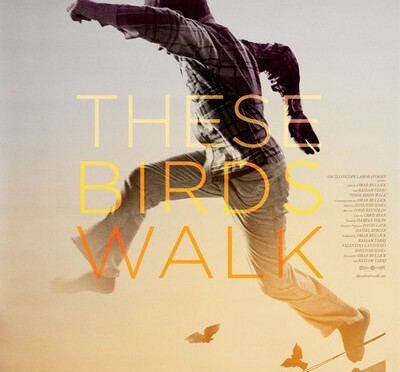 Omar Mullick is a film director and cinematographer known for his work on the 2013 feature film THESE BIRDS WALK. A 2016 Sundance Institute fellow, his most recent work can be seen on VICE’s HBO series, Black Markets, and the Gloria Steinem hosted show Woman on VICELAND. Current clients as a director and cinematographer include CNN, PBS, HBO, VICE, Discovery and The Gates Foundation. Trained as a photographer, his work has been published in The New York Times, Foreign Policy Magazine, National Geographic and TIME. He has received awards from the Doris Duke Foundation, the Western Knight Center for Journalism, Annenberg and Kodak. 2. 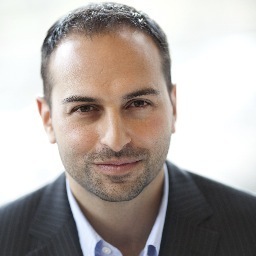 “Closing the gap between the world we have and the world most people everywhere want”, a virtual conversation with Ricken Patel, Founding President and Executive Director of Avaaz.org, the world’s largest online activist community. Ricken is the founding President and Executive Director of Avaaz, the world’s largest online activist community with 44 million subscribers in every country of the world. Ricken has been voted the “ultimate game changer in politics” (Huffington Post), listed in the world’s top 100 thinkers (Foreign Policy magazine) and described as “the global leader of online protest” with a “vaunting sense of optimism” (The Guardian). Prior to starting Avaaz.org, Ricken was the founding Executive Director of ResPublica, a global public entrepreneurship group that worked to end genocide in Darfur and build progressive globalism in US politics, among other projects. 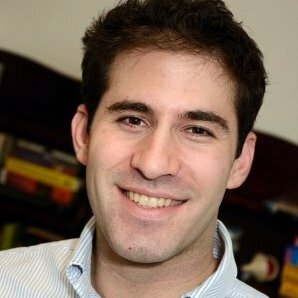 Ricken has also lived and worked in Sierra Leone, Liberia, Sudan and Afghanistan, consulting for organizations including the International Crisis Group, the United Nations, the Rockefeller Foundation, the Gates Foundation, Harvard University, CARE International and the International Center for Transitional Justice. Born in Canada, Ricken has a B.A. from Oxford University and a Master’s in Public Policy from Harvard. Joseph Goldstein’s first newspaper job was at the 6,000-circulation Daily Citizen in Searcy, Ark, where he wrote, among other things, a feature story about how meth-fueled treasure hunters in rural Arkansas were creating an underground economy for arrowheads and other Native American artifacts. He soon moved to New York City, where he worked at The New York Sun, until its demise, and later at The New York Post. He joined The New York Times in 2011 and writes mainly about the criminal justice system in New York. He has reported on the N.Y.P.D.’s over-reliance on stop-and-frisk tactics and about a secretive police unit that combs the city’s jails for Muslim prisoners in the hopes of pressuring them into becoming informants. He has covered Ferguson, the emergence of the alt-right, and Afghanistan, where he was based for a year. Sponsored by the Department of Political Science, Global Affairs Program at the Lang Center for Civic and Social Responsibility, Media Studies, Career Services, and Peace and Conflict Studies. 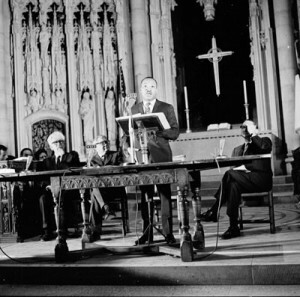 On April 4, 1967, Martin Luther King delivered a passionate address at Riverside Church in New York: “Beyond Vietnam”. He forcefully challenged the war in Vietnam and drew attention to the many contradictions of war, its atrocities, victims, and the poisonous impact of US foreign policy on the culture and soul of the nation. He also called for growing protest, reparations, and aid for victims of the war. Throughout the speech, he extended his critique of poverty and exploitation to the international sphere, especially in areas impacted by U.S. militarization. King spoke out despite criticism from others in the civil rights movement, who feared that he would distract attention from the movement and jeopardize domestic support. April 4, 1967 at Riverside Church in New York City. Left to right: Rabbi Abraham Joshua Heschel, historian Henry Steele Commager, Rev. Dr. Martin Luther King Jr., Dr. John Bennett (President of Union Theological Seminary in NYC). Photo by John C. Goodwin. *. King says “1954,” but most likely means 1964, the year he received the Nobel Peace Prize.